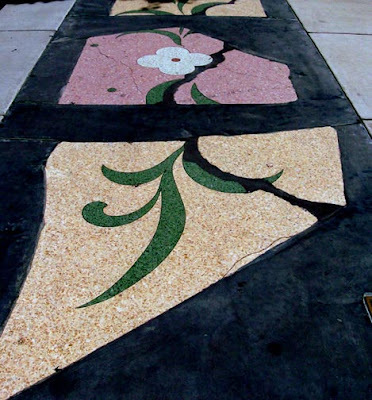 Tuesday in Hollister: Where is This? 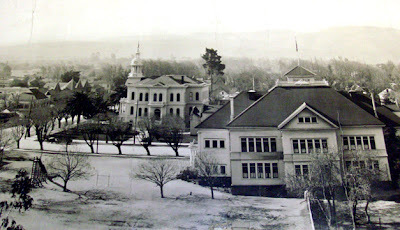 This week, I present you a photo of a photo of past times in downtown Hollister. Be forewarned that the image is distorted. The buildings in the photo look like they are happily and crazily leaning as they might in a 1930s cartoon. The image is part of a longer one in a display case at the Wapple House Museum, run by the San Benito County Historical Society. That said, take a look at the photo, circa 1900s. Where do you think this is? Do you know which street that is between the two buildings? Here are a couple of hints for you: School bells. Order in the court. Okay, one more: The photographer would be looking down from a grand vista in town. Go ahead, leave a comment with your guess below or at the Facebook page. I double dare you. The husband and I have been wandering around San Juan Bautista a lot lately. There are always new things to discover. A couple weeks ago, we wandered into a new shop called The Market Place. The first item that caught my eye was a cute tiny tot tutu. "They're like the ones at Dolce Baby (and Mommy Too) in Hollister," I pointed out to the husband. "They are," called the woman at the counter. "She makes them custom-made for me." 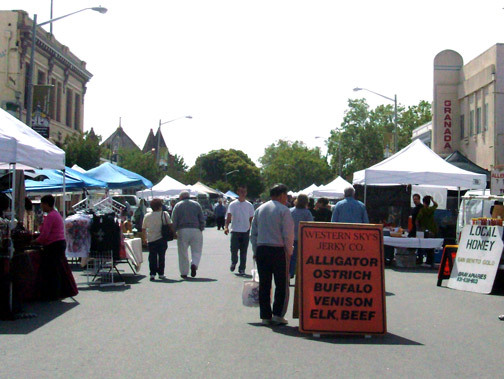 It turns out that The Market Place features local crafts, jewelry, food products, and other handcrafted items. 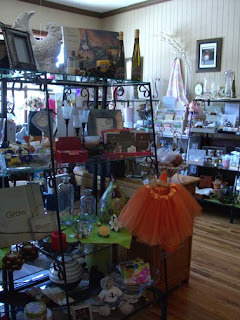 I felt pretty darn awestruck looking about the shop and realizing that they were made by various artists, crafts persons, farmers, candy makers, and businesses who live in the San Benito County area. The Market Place itself is owned and run by two locals, Sharon Shelton and Claire Del Curto. 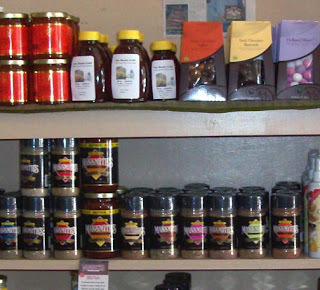 In fact, the enthusiastic woman behind the counter was Claire, who told us that they are always looking for more local items for the shop. So, there you go. Now you know where to go whenever you want to buy local items for gifts or for yourselves. 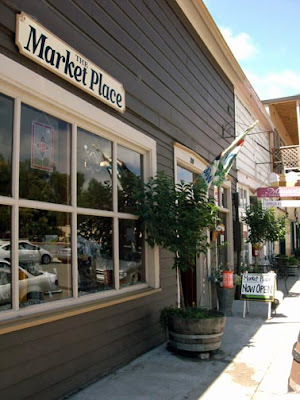 The Market Place is located at 209 Third Street, between the Daisy Saloon and Mom and Pop Saloon. You can also check them out on their Facebook page. and honey produced by Brays Apiaries. Autumn is around the corner. And, that means it'll soon be time to take Highway 25 down to Bolado Park for the county fair. 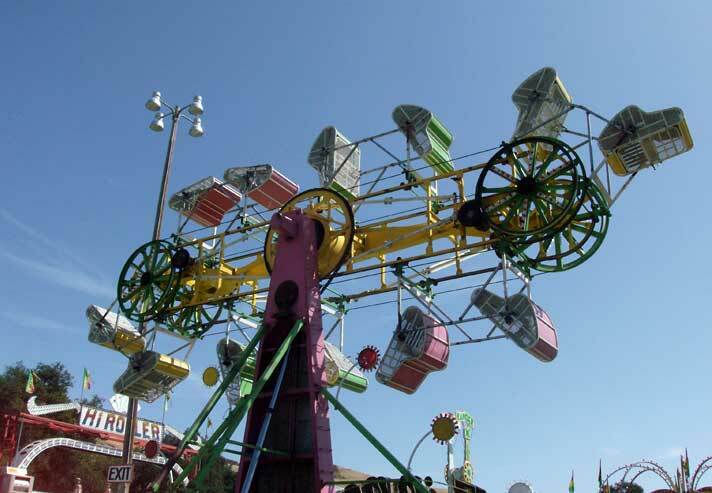 This year, our fair county will be celebrating its 87th county fair. Whoo-hoo! October 1 to October 3 are the dates. Mark 'em now on your calendar, before you forget. If you want to enter your baked goods, crafts, photographs, paintings, flowers, or other items in the fair, you still have time. The deadline for entries is September 3, 2010. You can send your entry form and fees to the fairgrounds office or take them directly there. For entry forms and details, head over to the San Benito County Fair Web site. 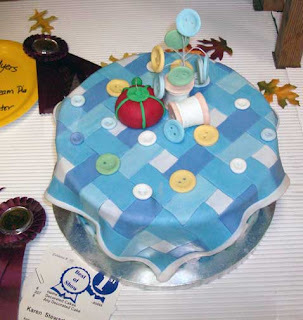 The baker definitely deserved top prize! Tuesday in Hollister: Whereabouts is This? This one ought to be an easy one. But then it may not be if the graffiti has been removed. I took the photo back in January. I've driven over the bridge many times since then. Saturday, for instance. But my mind draws a blank on how it looked. Funny, how that goes. Where is this bridge? Can anyone tell me if the graffiti is still there? Did you know that plans are in action to start building a new bridge in 2011? For details, check out the story in the Hollister Free Lance. Dear Take 25 readers, how many of you would love to have an arts center in town? 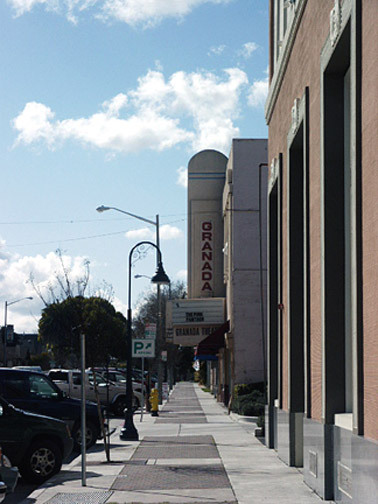 Can you visualize the Granada Theater on Fifth Street as the arts center? The Hollister Downtown Association and the San Benito County Arts Council have a vision to one day own the historic Berberich Building, which houses the Granada, and turn the whole building into a multiple-purpose arts center. For many decades, the Granada showed movies—first-run, classics, and international. 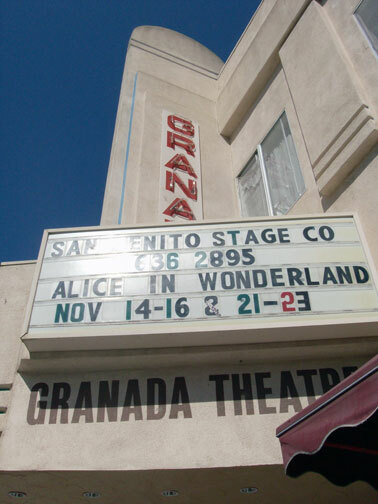 Today, it is used for live performances, including plays by the San Benito Stage Company. Now, dear readers, this is where you come in. The National Trust for Historic Preservation is holding a nationwide This Place Matters Challenge that will award $25,000 to the community that receives the most votes for its registered historic landmark. The Hollister Downtown Association registered the Granada Theater in the challenge and now needs our support. Head over to the Save the Granada Theatre page and vote. You will need to register for the site first, but that will take only a few minutes. As of today, only 38 people have voted for the Granada. Please pass the word around to your friends and family, whether they live in Hollister or not. You can easily do that by forwarding the link to this post. Thank you! 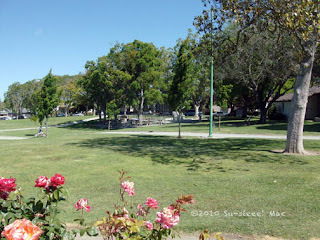 Tuesday in Hollister #2: Where is this? You can find several spectacular murals in downtown Hollister. Probably the most well-known mural is on the side of Johnny's Bar and Grill in Wentz Alley. How about this inspiring mural? What building does it grace? Don't know where it is, yet? Here's a hint: Across the street is a Mexican bakery. Any "oldtimers" out there? I've got some questions for you: What business first used that building? What took over after that business moved to the south side of town? I don't know the answers, but I really would like to know. Does anyone know when this mural was painted, and who painted it? Coming Soon: Music! Music! Music! Hollister will be rocking big time this coming weekend! Not one. Not two. But, three music events will be happening with a mix of new and well-known groups. Some of the performers will be local artists. It's musical heaven, I tell you. Rock and roll. Salsa. Funk. Jazz. Blues. Soul. Reggae. Folk. Tejano. Country. Alternative. Mariachi. And more! If you can't find music to please your body and soul, well, that'll just down right sad. On Friday, August 20, three legends will be performing at Paine's Restaurant on East Street (between 4th and 5th). Pete Escovedo! Uh-huh. In his 70s, the man is still smoking hot! Juan Escovedo! The eldest child of Pete, he has toured with Prince, En Vogue, Barry White, and Freddie Hubbard, to name a few. And, Suavé! The popular long-time band performs Latin Rock, classic rock, blues, and just about everything. The concert starts at 9:30 p.m. Advanced tickets are $20. Tickets will not be sold at the door. Dunne Park: Where the Action Shall Be! 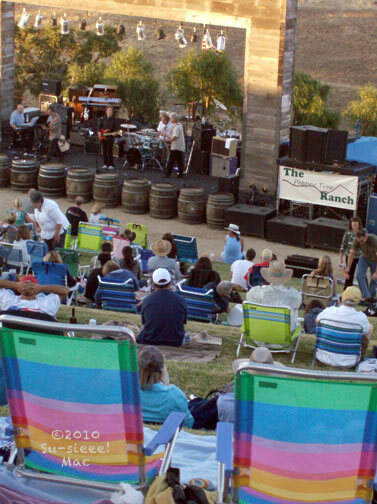 The Guerra Cellars' Hollister Concerts will also be taking place on Saturday, August 21at the Peppertree Ranch on John Smith Road. Time: 6 to 10 p.m. Tickets are $10. Shane Dwight and Extra Large will be sharing the bill. Music reviewers describe Dwight as a killer blues artist whose style draws from R&B, alternative country, jazz, and rock and roll. Extra Large is a soulful funk rock band based in Santa Cruz. It's motto is "We dare you not to dance." Vertigo: A feeling of out-of-whackness while looking down from high above. may keep the vertigo away while watching Vertigo. 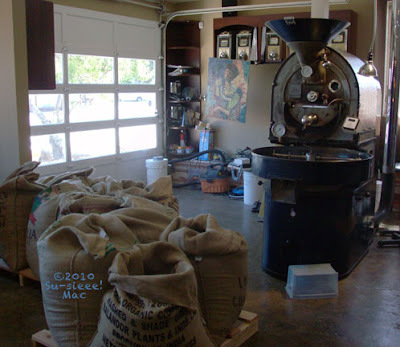 brewed Vertigo and yummy pastries seven days a week. Vertigo Cafe has been open for a few weeks now, but this weekend (August 14 and 15) is its grand opening. 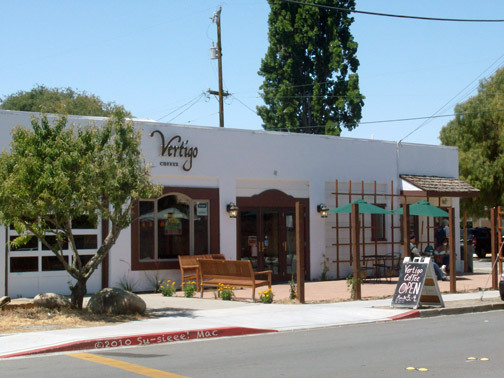 The Vertigo crew will be serving free coffee from 9 a.m. to 1 p.m. both days. 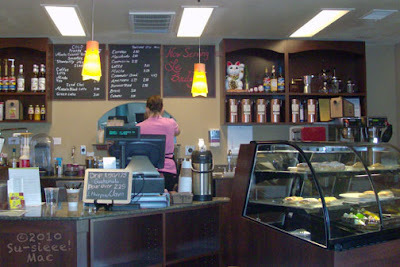 The cafe is located at 81 Fourth Street in San Juan Bautista. It's the first left turn, if you're turning right from Highway 156 (from Hollister). If you're already in the mission city, then either walk or drive south on the main street and turn right just before the Windmill Shopping Plaza. Just so you know, several events are happening in San Juan Bautista and other parts of San Benito County. Check it out here. Disclaimer: I purchase Vertigo coffee beans now and then and, obviously, have gone over to sip fresh brew at the cafe. I like the stuff, especially the organic beans. But, I have not been paid nor given free coffee for writing about Vertigo today. So there. P.S. I will gladly accept money or freebies for my writing. That is, depending on what it is. Tuesday in Hollister: What Was There? It's time to try something new here at Take 25 to Hollister. Yep, indeed. Every Tuesday, I'll post a photo of a place in Hollister. Try to guess what it is and/or where it is before I give you the answer. If you have sweet memories of the place, I welcome you to share it with us, either in the comments section or at the Facebook page. 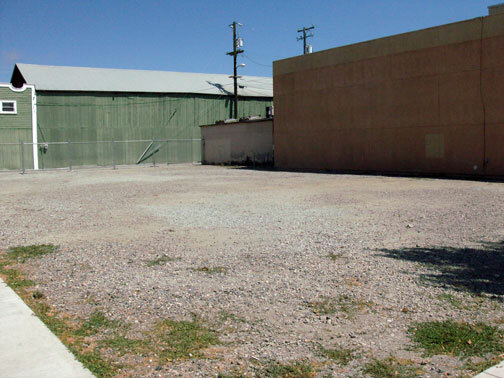 What business used to stand in this empty lot? This is all that remains of that happy and fun place. The building stood at the corner of San Benito and Seventh. It was damaged by the Loma Prieta Earthquake of 1989, but it was an arson fire that brought it down a few years later. Do you know what business it was? If you didn't guess it by now, this clue should do it: The building held 1,194 seats, according to the Cinema Treasures Web site. Yep, you got it. Click here to see the State Theater in its full splendor. What happy memories do you have about going to the movies there? Hey Muenzer's! Happy 100th to You!! Muenzer's Cyclery and Sports Center, most affectionately known as Muenzer's, is 100 years and 1 day old today! Whoo-hooo!!!! Muenzer's was opened in 1910 by Joseph A. Muenzer, who had bought a second hand store on Fifth Street and chucked everything but the bicycles. The store has evolved to meet the needs of the community. At one time, the store sold Harley Davidson and Indian motorcycles. 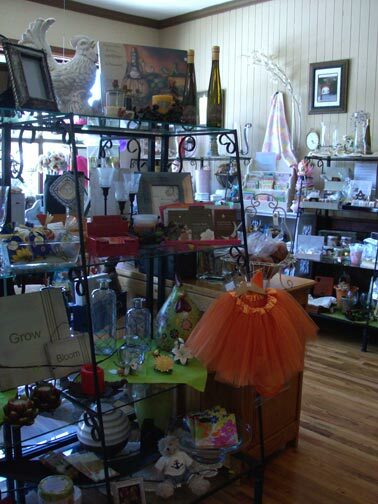 Today, the store is owned by Muenzer's grandchildren, Jan and Jerry. They offer locksmith services as well as sell sports equipment and clothing, local school athletic gear and gym clothes, Scouts badges and supplies, and much more. 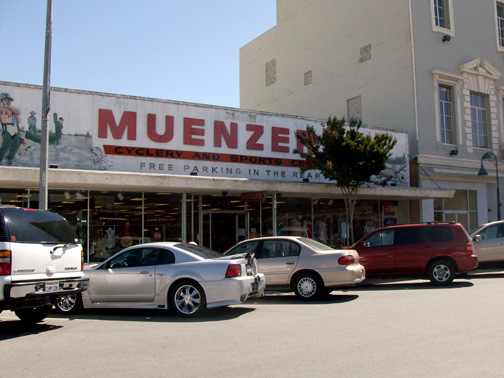 No doubt many of you, dear Hollister readers, have fond memories of purchasing bicycles, baseball mitts, tennis shoes, Baler sweatshirts, fishing poles, and other fun stuff that came from Muenzer's. My first bicycle was a blue Schwinn that my parents bought from Muenzer's. It was heaven. I pedaled it to places I was not supposed to go and got home before the parents knew about it. When the husband and I moved to Hollister seven summers ago, guess what was the first thing we did. Yep. 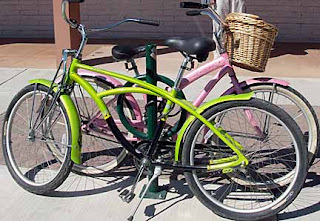 We headed down to Muenzer's and bought ourselves a couple of bicycles. Very cool ones, indeed. We have pedaled those bicycles all about town and then some. Any of you Hollister readers have memories you want to share? Tomorrow is Wednesday. You know what that means. The Farmer's Market! Haven't been there yet? It's on Fifth Street, between San Benito and Monterey streets. Lots of fresh vegetables, fruits, nuts, eggs, milk, chicken, and meat are there for the buying. 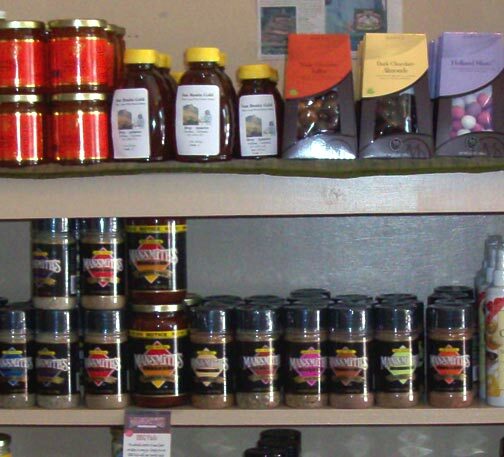 Honey, oils, jams, flowers, dried fruits, and various prepared food and non-food items are also available. Click here for a list of vendors. Please note that some vendors may no longer be there, and that new vendors, such as Claravale Farm (fresh milk!) and Douglas Ranch (beef, pork, and lamb) are not listed. Have kids? Come earlier for Story Time with Julie Engelhardt at Mars Hill Coffeehouse. That's just around the corner. It starts at 1:30 p.m. Theme is Let's GO! Cars, Planes, Trucks and Trains. "Kids can bring their favorite vehicles--boats, airplanes, cars, etc., and they can dress up like an engineer, race car driver, fireman, policeman...anything they like!" says Julie. Talking about kids, are you ready to hear a very talented group of young ladies? The Sledge Grits Band will be performing tomorrow at the Farmer's Market. Ages 7 through 14, these rocking gals have already been featured on the CBS Early Morning Show. Here's the link to their website. Check out the video of their CBS performance before heading over.